It has been an ongoing concern though every time we are hit by typhoons, flood and natural calamities because a lot of the companies in the BPO circle still don’t have well-entailed guidelines and flexible working policies towards employees being required to report to work despite the fact that work has already been suspended because of force majeure. The nature of work includes 24/7 customer service, phone and email support, banking services and technical assistance to clients mostly located in the U.S. and other countries abroad. Since the business is outsourcing, customers are not aware of the severe weather that we are experiencing. And the management is still expecting a high percentage of attendance to cater to the volume of calls per interval, causing great pressure to employees each time there are typhoons. The safety and welfare of employees to and from work should always be the main priority especially during severe weather. BPO companies should implement compassionate and considerate policies and work arrangements. 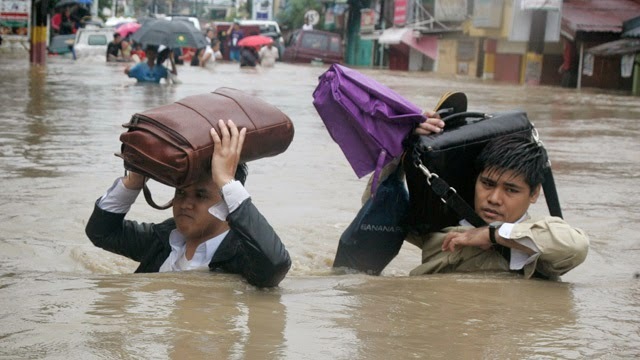 There should be incentives for those who bravely stormed the weather and the danger just to go to work and be paid on time, emergency or “compassionate” leaves for those who are really flooded, free shuttles for convenient transport, accommodation and free meals to those who are already stranded that they can’t go home anymore, or even to waive the loss hours as absences directly affect the month-to-date performances of the employees. Some companies will encourage their employees to ensure their safety first but that leads to loss hours as a consequence which is unfortunate because the employee wasn't paid already due to the absence and his performance still had suffered. DOLE (Department of Labor and Employment) should also have a direct sanction to BPO companies that will rule out their respective individual policies especially if an advisory/order has already been out for work suspensions. At the end of the day, the workforce is the blood of the company and BPO’s growth still depends on its manpower so they should work hand-in hand, most especially during the worst times. Jessie Dericto, 28 years old is a Freelance Writer, Blogger, Virtual Assistant and a nursing mom. She is also into fashion, photography, painting, and sketching. She loves sensible talks, long walks and activities that enrich the mind and soul.